Rosetta probe's 10-year comet chase Jump to media player Europe's Rosetta spacecraft has made a rendezvous with a comet - after a 10-year chase. Chasing the secrets of life in space Jump to media player Scientists hope to explore the origins of life in our Solar System, with a historic study of a comet. What will Rosetta spacecraft do? Jump to media player Scientists are poised for a key moment in the history of space exploration when a spacecraft attempts to rendezvous with a comet on Wednesday. How comet particles are analysed Jump to media player With the Rosetta spacecraft in orbit around comet 67P/Churyumov-Gerasimenko, scientists are hoping for a windfall of new information about these strangest of objects. Final preparations are under way for what could be one of the most ambitious feats in space exploration. 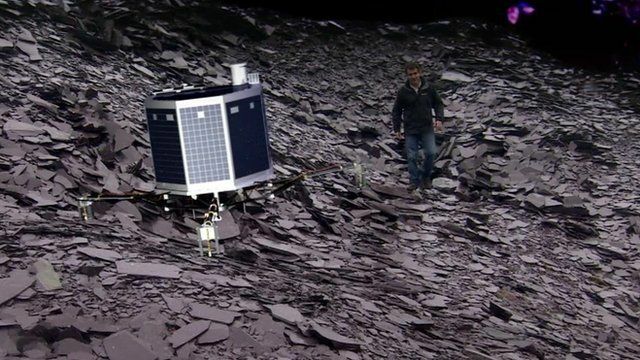 On Wednesday, the European Space Agency will try to land a tiny spacecraft on a comet. This has never been attempted before. The comet is about 300 million miles away (500 million km), far beyond Mars and is racing through space at about 34,000 mph (55,000 km/h). Esa's Rosetta satellite has flown for 10 years in a four-billion-mile (6.5 billion km) series of loops around the Sun to pick up enough speed to fly alongside the comet, and it will now release a lander, called Philae, to try to touch down. But the landing will be extremely challenging, as BBC Science Editor David Shukman explains.